When can I select Rx? 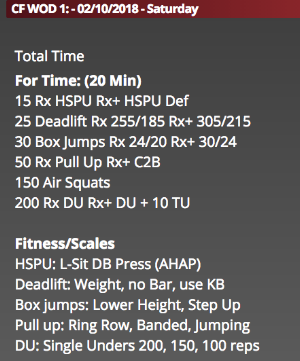 When you score your WOD, are you still wondering what that Fitness/Scaled, Rx, and Rx+ selection is all about? It’s is important for you to understand this. Tracking your workouts properly is key to understanding and seeing your progress over time. If you don’t track, you can’t measure! In the WOD below, the Rx “Prescription” calls for Handstand Push Ups (Set standard, on a flat surface), Deadlifts at a specific weight, box jumps at a specific height, pull ups (Chin over Bar!) air squats (performed full range of motion) and Double Unders (jumping rope with 2 rotations and one jump) and every movement has specified reps.
ANY deviation from that entire workout, you do NOT score it as Rx. You score it as Fitness/Scaled, and best to track in the notes area exactly what you did. Stay tuned for more understanding of Fitness/Scaled and why it’s not a “Bad” thing to scale. Why it is important to scale movements and what those Scales/Progressions will do for you and your fitness. Hint… the scales get you the Rx movements and also make you better at them when you have them!! More to come!